Many people wondered how the Islanders would respond to a 6 day layoff. The only activity the team had over the past week was practice. The lack of game activity definitely showed last night with the loss to the hurricanes. Ruslan Fedotenko, Marc-Andre Bergeron and Mike Sillinger scored the goals for the Isles, however Sillinger's goal came with 5 seconds left. The team definitely showed the signs of rust, and that's really what it comes down to. Most of the goals given up were very soft, however not one person is to blame for this. While Rick DiPietro didn't have his head in the game, he didn't have much help from the defense. The forwards had trouble holding the puck and did not play with as much fire as they have shown in the past. With their next game on Thursday, it doesn't appear the team will get days off this time around. As a matter of fact, I expect Nolan to work the team very hard and I expect them to be prepared for Thursday against the Tampa Bay Lightning. The team is better than what the game last night showed. We know it, the fans know it, and the team knows it. ON THE AIR TONIGHT: Sean and I will be on the air once again tonight at 10 PM on http://myweb.cwpost.liu.edu/dcox/website/listen.html. As always, we will be taking calls and instant messages via AIM. For those unable to listen, we will be putting up the podcast version and we hope to have that up quicker than we have in the past. On Monday, the Islanders received word about the status of defenseman Bryan Berard. He will miss the next 2-4 weeks with a groin injury. He hurt the groin in the second period of Saturday's game against the Devils. Fortunately for the Islanders, Berard will only miss a handful of games with the way the schedule is set up. The team plays 5 games in the next 3 weeks. So it is possible Berard will only miss the 5 games and not much more. The team took a big jump in all of these from the last week. It is definitely a nice thing to see. Some weird things going on with ESPN's though in my opinion. Right now, it appears that the team is going with the same lines as last week. The idea of don't fix what isn't broken. Still no word on Shawn Bates and his status for Saturdays game. We'll keep you updated on that front. Check back for other news and notes as well. Bill Guerin scored with 3.7 seconds left in overtime to give the Islanders and 4-3 win over the New Jersey Devils. It was a game that probably should have never gone to overtime though, as the Isles blew their second consecutive 2 goal lead. However, the Isles still found a way to win it and finished the week winning both their games. Early in the game, turnovers looked like they were going to kill the Isles. Their second turnover in the first minute of the game led to a Zach Parise goal. As much as the Devils have struggled this year, you can not turn over the puck continuously to guys like Pairse, Patrik Elias, Brian Gionta and Dainius Zubrus. The Isles came out much stronger in the 2nd period, scoring 3 goals. The first was scored right after a power play ended. Josef Vasicek took a blocked shot attempt by Miroslav Satan and moved to the front of the net and beat Kevin Weekes to tie the game. Shortly after that, Satan got one himself has he moved around Paul Martin and then a sprawling Weekes and slipped the puck passed him for the 2-1 lead. With about 8 minutes to go on the period, The Isles were on the power play. A nice pass from Ruslan Fedotenko to Bruno Gervais produced a one-timer shot from Gervais, that hit the crossbar and landed somewhere in the crease. The puck bounced out to Mike Comrie who quickly shot it passed Weekes for the 3-1 advantage. The team went into the 2nd intermission with a 2 goal lead, the worst in hockey. The Islanders came out a bit sloppy again in the 3rd, and the Devils seemed to control more of the play. A fluke goal was scored by Jay Pandolfo when he shot the puck and it deflected off of Andy Sutton's leg and sailed over DiPietro. The Isles then failed to convert on a 4 minute power play and once it concluded, Brian Gionta tipped a Paul Martin shot in to tie the game at 3. In Overtime, after some great end to end action that saw a flurry of saves and even Chris Campoli spoil a breakaway by Sergei Brylin, it was the heroics of the captain, Bill Guerin, who had a loose puck bounce his way and he hammered it home for the win on the power play. Obviously, even though they scored 2 power play goals the team seemed to have trouble with some of the set ups and what not. That is most likely due to the loss of Bryan Berard, who left the game early on with what is being described now as a groin injury. With a week off, I really hope Berard can take the time to get healthy enough and get some practices in. It also appears Shawn Bates could be back for the game next Saturday as well, so it should be interesting to see who will sit in favor of him. So a successful week in islanders hockey, and now we must wait until next Saturday until we see the Isles again. WE'RE ON THE AIR TONIGHT: Sean and I will be on the air again tonight, at 10 PM on http://myweb.cwpost.liu.edu/dcox/website/listen.html. We're on webradio, not on the FM station. Just as last week, we will have a phone line and an AIM screen name running so you can send us your thoughts and questions. We'd love to hear from any fan as we love discussing hockey in general, but especially the Islanders. Hope to hear from some of you tonight. For those who can;t listen, we will put the podcast form up. We'll let you know when it is there. Through 6 games, all Bill Guerin had to show offensively was 6 assists. Even though he played well in those 6 games, a sniper like him always like to put pucks in the net. He would have been happy with one. Guerin not only scored his first goal as an Islander in the game, but he also had his second and third. The monkey on his back had been lifted. Two of his goals came on the powerplay, something the Isles had trouble with over the last 2 games. However, it was Bryan Berard's power play goal for the team that would end up being the game winner. Berard one-timed a pass from Chris Campoli at the point with 10 minutes left in the 3rd period to put the Islanders up for good. Berard now has 2 goals and 2 assists in 4 games with the team. Campoli had 4 assists and was noticeable all game. He was strong at both ends of the ice and has impressed many through each game this season. Sean Bergenheim also scored for the Isles, his first goal since March of 2006. It was nice to see Bergie get the first one after coming back from Europe this year. He has really done wonders on the 2nd line playing with Josef Vasicek and Miroslav Satan. Alex Ovechkin and Tomas Fleischmann scored for the Capitals. Their goals came about 5 minutes apart after a goal by Ruslan Fedotenko was disallowed. It appears that the goal should have been allowed, but the NHL said they didn't have enough evidence and the call on the ice stands. After that, Washington seemed to get momentum and quickly got on the board with Ovechkins goal. Even after all that, the Isles were able to get it together and get a powerplay, the one that Berard converted on for his game winner. Despite all the scoring, Rick DiPietro was once again spectacular, making 27 saves on 29 shots. The Isles were out shot, and many times it looked as though Rick didn't have time to relax as he always had to be on his toes. A game like this could be just what the doctor ordered for the team. Bill Guerin finally scoring should make things easier for him. It would be nice to see Satan and Mike Sillinger step up their game a little bit, and hopefully they can start that next game. Sillinger has been a 60 point scorer the last few years and the Isles would really like to see him do it again this year. Both he and Satan have yet to score a goal this year. The next game is Saturday night against the Devils at the Coliseum. The Devils have had some early season problems and Marty Brodeur has looked shaky at best. Hopefully the Isles can pull one out and have a very successful week. Looking to spark some more offense out of the team, head coach Ted Nolan decided to switch up some of the lines at Wednesdays practice. Bill Guerin was moved to the line with Andy Hilbert and Mike Sillinger, while Trent Hunter was moved to the line with Mike Comrie and Ruslan Fedotenko on it. The Islanders first line did a great job the first couple of games, however they have cooled off since then. Time will tell if the new lines will work, but it does come as a bit of a surprise this early in the season, especially since the Fedotenko-Comrie-Guerin line looked great in preseason and the beginning of the regular season together. Hunter and Sillinger have been relatively quiet in terms of offence, so Nolan hopes the changes benefit both of them as well as the others. Also spotted at practice was Shawn Bates. He is very close to returning, but has been cleared to play. On the teams website, Nolan said he will put Bates through rigorous practices over the next week and if he hold up well there he will return. Hopefully Bates can come in and chip in the way he once was able to before his groin issues. Marc-Andre Bergeron appears to be the odd man out once again going into Thursday's game with Washington. Nolan said that he has to work his way back into the lineup, and Bergeron understands that. I know he is a small guy and I don't expect him to constantly hit people off the puck, but as a defenseman he should be able to poke check the puck off an opposing players stick or at the very least be able to control the puck very well on offence. Both of those aspects have been tough for Bergeron, but I do feel that he could turn it around. We'll see though. As Sean and I said, it is interesting to think what could happen if Bergeron is unable to make the lineup again. With the recent appearance of Jeff Tambellini, one that didn't last very long, you have to wonder if there is something going on with Jeff. I know the Isles respect him and feel he is one of their top prospects, but he has been unable to stick even after Jon Sim went down with injury. If a deal came up where both Tambellini and Bergeron could be packaged, I would imagine Snow would look into it. It's no secret the team needs help offensively, not to mention a really good top pairing defenseman, but I think they can get by on what they have right now as far as defense goes. If Bergeron has a hard time making the lineup, I think this might be something worth watching more closely as time goes on because if the team continues to score goals, something could go down. Snow has already proven that he's not afraid to pull the trigger to fix his team, and that wouldn't be any different this early in the season. Our podcast from this past Sunday is up at http://www.nyifyi.mypodcast.com/. It was our first live show and it went very well. We tried to do as much analyzing of the games that were in the past week and picked apart some specific things we noticed. Unfortunately, no one called in but hopefully as time goes by people will. For now, enjoy it and don't forget that we will have recaps of the games this week right here. One of the goals the Islanders had going into Saturday night's game in Philadelphia was to play much better. While they did accomplish that throughout most of the game, they still came up short. A bad second period by the team cost them 2 goals. After a great start to the first period, which saw the Isles with the puck for most of the time, the team failed to put the puck in the net and went to the dressing room tied at zero. About 7 minutes into the 2nd period, the Flyers' Jeff carter scored on the powerplay to take a 1-0 lead. The puck snuck past Rick DiPietro, and some players did not even realize that it went in. Two minutes later, Sami Kapanen scored his first of the year after a failed clearing attempt by the Isles. The puck was under Radek Matinek, who failed to see it between his feet. A Flyer chipped the puck back to Kapanen, who was all alone on the left side of the net and put the puck past the sprawling DiPietro. It was a save that he could have made, but was tough for him to get over quickly enough to save the defensive break down. Josef Vasicek scored the only goal for the Isles in the 3rd. Though they pushed hard to tie the game, the Isles could not. Jason Smith scored an empty net goal with 5 seconds left to put the icing on the cake. Sean Bergenhim played really well in his debut on the 2nd line. He will have 4 days now to work out the kinks with Miro Satan and Vasicek. meanwhile, the Isles first line seems to have hit a wall. Mike Comire has been brutal defensively, and Bill Guerin is having a hard time finding the net, as is Satan and center Mike Sillinger. All of them will have to step it up if they expect to have any sort of success this season. While it is not time to panic yet, a 3-3-0 start is a bit disappointing after starting off 2-0-0 and 3-1-0. But at any rate, 6 games in and plenty of time to figure things out. DiPietro had a string game, and a lot of the teams success will depend on how well he plays. As good as he is, 1 goal per game wont cut it. The teams next game is Thursday against Alexander Ovechkin and the Capitals in Washington. This past Monday the teams played and Washington was victorious, winning the game 2-1 even though the Isles had the 31-12 edge in shots. Should be interesting to see if the team can rebound from their little slump. FIRST LIVE SHOW ON TONIGHT: Tonight at 10 PM Sean and I will be on the air live. We will take calls and also have an AIM screen name set up to take comments or answer questions. The website for the show is http://myweb.cwpost.liu.edu/dcox/website/home.html. Under the Webradio column, select either the Quicktime Player or the Windows Media Player. For those who can't listen to the live show, we will put the podcast up at the site in out links section for the NYI FYI Podcasts. We look forward to hearing from all of you tonight! On Thursday the Islanders lost to the Toronto Maple Leafs 8-1. It was such a disappointment of a game from the Isles as they seemed to be just going through the motions. The defense as a whole was terrible in front of backup goalie Wade Dubielewicz. Ruslan Fedotenko scored the only goal for the team as he deflected Bruno Gervais' shot from the point on the powerplay in the first period. The Isles went into the first intermission only down 2-1, and it seemed that they could still try and battle back. But that's when it started to go sour. About 7 minutes into the 2nd, Thomas Kaberle scored for the Leafs and then the goals started to come. For a period and a half, the Isles were hanging in there and could have easily scored to change the momentum but failed. One thing that killed the isles, aside from their terrible defense was penalty trouble, especially from Jeff Tambellini, who took 3 very lazy and unnecessary penalties. On the subject of special teams, the Isles power play wasn't anything exciting either. They tried to be too fancy and the men at the point, especially Marc-Andre Bergeron had a hard time controlling the puck, which lead to some shorthanded odd man rushes for Toronto, one of which they scored on. With a tough loss like this all you can do is hang your head high and play better next time out. As I said, for a period and a half things were OK, but the Isles were unable to take control or change the momentum when they had the opportunities. That next shot comes Saturday night against the Philadelphia Flyers. The Isles lineup will look a bit different. On Friday, the team sent down forward Jeff Tambellini, who failed to stick after getting his shot when Jon Sim went down with injury. Sean Bergenheim, who has looked good in the limited amount of ice time he has seen, now moves up to the second line to play with Miro Satan and Josef Vasicek. Chris Simon also returns for the game, and Shawn Bates is very close to returning. On defense, the Isles are scrapping the idea of going with 7 defensemen and going back to 6, which means one of Bergeron, Gervais, Bryan Berard and Chris Campoli will not be playing. Based on play, Bergeron might be the odd man out. But there has been no inclination from coach Ted Nolan as to who will be sitting. The game is a bigger one than it might seem for so early in the year, but it is huge. You always want to win games against your division, and a win would out the isles at 4-2, 4 points better than anyone else. With the lack of games between now and the end of the month, it is important to stay up around the top of the division now so that you are not constantly playing catch up with the others. 3-3-0 is not terrible, but seeing as how bad the 2 losses have been so far, (the one against Washington should have been one, the one against Toronto might have been a loss either way), 4-2-0 would sort of make up for all of that. 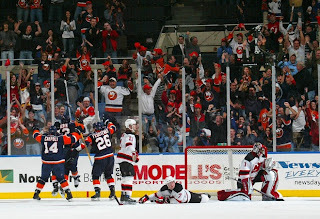 The return of Simon should rally the troops well, not to mention the return of Rick DiPietro to the nets. We'll see what happens. Bryan Berard was excited to be back on the team he started his career on. He was thankful that Ted Nolan and Garth Snow gave him the opportunity to get a spot on the team in training camp. Well, the Islanders are thankful to have him. Berard's slapshot on the powerplay midway through the 2nd period ended up being the game winner. Assisting on Berard's goal were Bill Guerin and Marc-Andre Bergeron, who had a goal of his own earlier in the game. It seemed like a perfect set-up for Berard's first game back on the Island. What better way to get into it other than the first Isles-Rangers game of the year? And to score the game winning goal to boot. Bergeron's goal came in the first period on a rare 3 on 3 with 3 seconds to go in the period. The puck was between Mike Sillinger's skates, and Bergeron skated in from the blue line and wristed a shot passed a surprised Lundqvist. Rick DiPietro had an excellent game. DiPietro stopped 36 of 37 shots and was a huge reason the Islanders won tonight. Overall, the whole team played really well, but Rick kept the team in the game, especially in the 3rd period. Some kinks still need to be worked on defensively, but the team was much better tonight. Many times they kept the Ranger shots to the outside and looked good on their penalty kills. Aside from the goal he scored, Berard looked very good defensively. The signing could turn out to be a very good one as the Islander powerplay looked like it improved dramatically overnight. Berard was very active and seemed to be communicating with many of the other players on the PP with him too. All in all, a very good night indeed. Not the best game both teams could play, but whats important is the final score and the Islanders end up with the 2 points. at 3-1-0 now, the Islanders are still 4 points better than others in the division. Though its still early, its always good to build a lead while other teams are struggling. The ability to do that means that you are just a step ahead of the others and have already gelled. Hopefully, that is the case here and the Isles can keep up their winning ways. They will try and go for 4 wins Thursday night in Toronto at 7:30 PM. The game should be an interesting one. SURGERY FOR SIM? According to Newsday's Islander beat writer Greg Logan, Jon Sim's season might be over. Logan indicates that he will have surgery after getting another opinion on Thursday, and the surgery could very well end the year for Sim. He injured his knee on a failed check attempt in the home opener against Buffalo, and it looks to be a torn ACL. Hopefully things aren't as worse as they seem and we will see Sim again real soon. Most of us were looking forward to watching him this season. 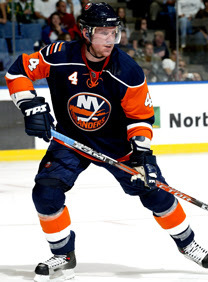 The Islanders announced today the signing of defenseman Bryan Berard to a 1 year contract worth $725K. The signing comes as no surprise as Berard impressed coach Ted Nolan after he was invitee to training camp. Berard came into camp with the goal of earning a spot on the Isles roster, and it was successful. he was a notable force on the power play in the action he saw in the preseason. Over the weekend, the Isles had put defenseman Freddy Meyer on waivers. He was claimed by the Coyotes yesterday afternoon. The purpose of that move appeared to make room for the signing of Berard, which seemed imminent even though he wasn't one of the 8 defensemen to make the team out of camp. Meyer and Aaron Johnson grabbed the 2 extra spots. With Meyer out now, Berard has the spot. Berard practiced today along side Johnson, who can't be sent down without clearing waivers. The Islanders seem to be holding on to him for now, as they just signed him this past summer. It seems as though Nolan plans on using both Berard and Johnson soon, and Bruno Gervais might be a casualty of that. It seems likely that Berard will be in the lineup Wednesday night when the Islanders take on the Rangers at the Coliseum. INFO ABOUT THE PODCAST: There appears to be some spotty problems occurring with the podcast. For some people recently, the entire podcast is not downloading. Sean and I are working on fixing the problem, but it appears to be a problem with the host. It seems that if you subscribe to the podcast through iTunes, the entire thing downloads. Or, try to download the podcast again tonight or tomorrow sometime. Again, we are trying to figure out whats going on, and if we have to switch hosts we will update you and update the link as well. The Islanders lost 2-1 to the Washington Capitals on Monday at a sold out Nassau Coliseum. It was the second straight sellout at the NVMC. Richard Park scored the only goal for the Isles, while old friend Viktor Kozlov and Brooks Laich scored for the Caps. One thing that killed the Isles today was their power play, as it had no power. Many chances to score were ruined. The power play seemed a bit hesitant and slow. The first 2 games the power play was OK, the first game being the best. That is something that has to work in order for the team to continue to be successful. What caused the Isles to lose the game was a failed clearing attempt by Mike Comrie. Comrie tried to clear a puck up the middle, where it was intercepted by Michael Nylander. Nylander passed it to defenseman Brian Pothier, who got the shot on net where Rick DiPietro left a huge rebound that was buried by Laich. The Isles weren't able to get a marker of their own for the rest of the period. The Isles played a good game today, but it definitely feels like the team should be 3-0 right now. They out shot Washington 31-12, but netminder Olaf Kolzig did the only thing he knows to do against the Isles-play solid and win. The team must say "oh well" and look towards Wednesdays game against the Rangers. That will be a tough one and I feel is a must win, as it wouldn't be very good to go 0-2 after starting 2-0. LINK TO PODCASTS ADDED: We have added a link on the side to our website for the podcasts. The first show is up from Sunday, where we talk about the first 2 games in Buffalo and analyze the 4 games the Isles have this week. One game has past, but games still remain against the New York Rangers, Toronto Maple Leafs and the Philadelphia Flyers. Listen to the show to get our rundown and how we think things will shake out. FREDDY MEYER CLAIMED BY 'YOTES: Defenseman Freddy Meyer was claimed off waivers by the Coyotes today before the noon deadline. Meyer played in 35 games for the Isles, all last season and was 0-3-3 with an even +/- rating. This paves the way for a possible signing of defenseman Bryan Berard, who had a good camp with the Isles on a training camp tryout. He would definitely help the power play as well. JASON BLAKE ILL: Jason Blake announced today that he has been diagnosed with Chronic Myelogenous Leukemia, which according to Blake is a disease that is easy to treat. He is taking a pill that is working well, and does not expect to miss any time. Still, we are hoping for the best and hopes that Jason comes out strong here and does not get worse. Get well Jason, you have many fans here on the Island and we appreciated all you did for the team in your tenure here. Here's to a speedy recovery for Jason. Park Re-signed, Tamby Recalled, New radio Show Begins Tonight! Lots of news in Islander Country today. First, forward Richard Park was re-signed to a 2 year contract. He is now under contract through 2009-2010. The deal will pay him $1.5 million over the 2 years. A very good deal in my opinion. Park has done well as the Islanders 4th line center for most of last season and so far this season. Always good to get your own players in the fold early on. Another big story today was that forward Jeff Tambellini was recalled from Bridgeport. He is going to play for the injured Jon Sim, who will miss some times with a sprained knee. Many islander fans will be happy to see Tamby back up with the team, and I know I am one of them. I am looking forward to tomorrows game and seeing how he does. Hopefully Jon Sim has a speedy recovery. Last, but certainly not least, is the debut of our new radio show is TONIGHT! Our show will be on at 10 PM, on http://myweb.cwpost.liu.edu/dcox/website/home.html. When the pop up shows, click on Windows Media Player under the Webradio column and enjoy! Unfortunately, due to some programming issues at the radio station, this show was pre-recorded and is missing some news such as the Park signing and the Tambellini call up. That is just for this week though, as we will be on live every Sunday starting October 14th. Starting then we will also have a telephone line available where you can call in and talk Isles hockey with us. Also, we will be uploading a podcast version of the show on http://nyifyi.mypodcast.com/. That should be up and running by tomorrow. So, make sure you tune in or listen to the podcast, and hopefully we'll here from most of you when we start going live next Sunday! The Islanders returned to the ice on Saturday night in front of a packed Nassau Coliseum. This time, it was the Isles home opener and the Sabres hoped to spoil it, much like the Isles had done the previous night up in Buffalo. Unfortunately for the Sabres, Isles new first line center Mike Comrie continued where he left off on Friday night. Comrie scored 2 goals for the Isles, including the game winner. He had also scored the game winner in the season opener. The rest of the line kept up the pace as well, as Ruslan Fedotenko and Bill Guerin each had 2 assists. Comrie has impressed many so far, scoring 4 goals and 2 assists in just 2 games. The entire first line has combined for 16 points in 2 games. I was at the game, and I must say the atmosphere was great. The fans were really into it, and very loud. The game felt like it had a playoff atmosphere. The team was not as disciplined as it was Friday, but they were able to work through it, only giving up 1 power play goal to Jaroslav Spacek in the 1st period. Team defense was a lot better in this one, and Bergeron and Sutton played much better together. Witt and Martinek were themselves, and Campoli-Gervais were doing a good job of creating opportunities. Rick DiPietro was solid in net, and seemed to be very alert on most plays. Still some room for improvement in areas, but hopefully Dunham will sit down with him regarding those in the near future. For the Islanders, it is the first time they won their first 2 games of the season since the start of the magical 2001-2002 season. It will be very interesting to see if they can keep up the momentum heading into Monday afternoon's matinee against the Washington Capitals, where Tom Poti and Viktor Kozlov make their return to the place they called home last season. In the 3rd period, Jon Sim sprained his knee on a failed hit attempt, and left the game and did not return. His status for Monday is unknown. Some random things of note: Freddy Meyer was put on waivers by the team before the game. Meyer has until noon on Monday to clear. If he does, he will be sent to Bridgeport. Bryan Berard was in attendance for the game, and according to Steve Mears he is still practicing with the team even though he is not on his try-out anymore. Have to wonder if some things will start to fall. I say it will and this is something to keep our eyes on. All the waiting finally came to an end on Friday night with the drop of the puck in Buffalo. Although the Sabres scored the first goal 2:56 into the game, coming from Jaroslav Spacek with 4 seconds left in the first power play of the game, the Islanders never gave up in what became a seesaw battle. Josef Vasicek scored the Islander's first goal of the year at 9:16 of the first to tie the game at 1. Buffalo answered shortly after that, with Derek Roy scoring on a nice one-time pass from Maxim Afinogenov and 12:04. The Islanders scored the next 2 goals, both power play goals, 34 seconds apart. The first goal came from Ruslan Fedotenko, off a nice pass from new captain Bill Guerin. The second goal was scored by Chris Campoli off a nice pass from Fedotenko right to the front of the net, where Campoli snuck in and parked right in front of Sabres' net minder Ryan Miller. Drew Stafford scored the last goal of the period, off of a bad clearing attempt by the Islanders and a poor defensive play by Marc-Andre Bergeron in front of Rick DiPietro. The first period ended with the game tied at 3. Things settled down in the 2nd period as only 3 goals were scored; 2 by the Isles and one by the Sabres. Comrie scored 7:35 into the period on a great touch pass from Fedotenko, who found Comrie in front of a wide open with Miller too far to the left in the crease. Thomas Vanek scored on an unconventional breakaway shot, a slapper from 15 feet out. The wind up seemed to catch DiPietro off guard, and the game was tied at 4. Comrie scored once again, at 16:04 of the period on a nice breakaway pass to himself. On a loose puck, Comrie chipped the puck forward and raced past Sabres' defenseman Toni Lydman and shot the puck off of the crossbar and past Miller. The Islanders would score once more in the game, on a power play in the 3rd period. Trent Hunter got the goal on a scramble in front of the net and chipped the puck past miller and it trickled into the net. That is a combined 3 goals and 7 assists from the top line. Even if it was the first game of the year, one must keep in mind that these 3 did the same things in preseason, when they were playing the same way they played last night. In the three preseason games the trio played in, the team went 3-0. The power play also looked much improved and had a much different feel to it as well. The coaches did a good job of revamping that. The team went 3 for 4 on the power play, and the team only took 3 penalties themselves, which was very rare for them to do last season. The play a much more disclipined game it seems. The defense still needs some work, but for the 2nd half of the 2nd period and all of the 3rd the Isles seemed more comfortable and were able to shutdown the Sabres. The paring of Radek Martinek and Brendan Witt looked very solid. Earlier in the day, the Isles re-signed Martinek to a 3 year contract, and I can see why. When healthy Martinek is very solid out there, and was the best Isles defenseman last night. The Isles outshout the Sabres in the 3rd 11-5, and 34-26 for the game, also a rarity last season. The team appears much more faster than last years and much more resilient. They play as a cohesive unit, and most of that stems from new captain Bill Guerin. It's the little things that count and Bill Guerin did so many of the little things right that it made me happy to watch. If this franchise is going to gain some respect back, Bill Guerin will have a huge part in that matter. Not only with his play on the ice, but his rep with the refs, his voice on the bench, in the lockeroom and his service around the community. Some will argue that the Sabres aren't good anymore after losing Chris Drury to the Rangers and Danny Briere to the Flyers, but they really aren't paying attention to the NHL. Despite those losses, the Sabres still have a very high powered offense. Vanek scored 43 goals last year and had 84 points. Derek Roy had 63 points in 75 games, while Afinogenov had 61 points in just 56 games. The 3 made up the Sabres 3rd line last year. That is a first line on every other team in the league, and is a first line for the Sabres this season with the departure of Drury and Briere. The Sabres still have Jason Pomminville, Jochen Hecht, Tim Connolly, Ales Kotalik and Paul Gaustad among others. Many of these players are young and still up and coming and some will even put up big numbers this season with increased roles. Not to mention the defense is still in tact from last year, and they still have Ryan Miller in net. It is very encouraging to see a team go into an opponents building and win a hard fought game. Its even more difficult to do it at your opponents home opener, when they are raising their presidents trophy banner from being the best team in the NHL last season. It is a feat the Isles should be proud of. However, with the Isles home opener tonight against the Sabres, I would imagine they are looking to return the favor. The Isles need to tighten up defensively and try to keep things simple. Their offense has proved to be much faster than last years, and they will get their opportunities on that front. Draw some penalties, get a goal or 2 on the power play and play good defensively and things will be fine. Just don't get too confident over last night as Buffalo will certainly be making adjustments going into tonight's game. I will be there in section 338, cheering on the Islanders. Sean will be there, but I'm not sure where yet. Here's to a 2-0 start for 07-08!